Students to IDEM (Indiana Department of Environmental Management)... Gary is Not a Dump, Our Education is More Important than a Dump! Substance photo by Kim Scipes.Over 80 students, teachers and supporters of the Steel City Academy in Gary, Indiana, rallied and protested Thursday night, May 10, 2018, first at the United Steelworkers of America #1014 hall and then later at the Steel City Academy campus on 35th Avenue, both in Gary. Emotions were high as the efforts were to convince IDEM (Indiana Department of Environmental Management) to not permit Maya Energy to set up a “solid waste processing facility” (aka, a “dump”) across the street from the school. Maya Energy, whose principle owner is a former City Councilmember in East Chicago, IN, James Ventura, wants to build a $50 million, 165,000 square foot facility approximately 100 feel across the street from Steel City Academy, a charter K-12 school with 280 students. The project is intended to process up to 2,400 tons—4.8 million pounds—of waste a day; 1600 tons of municipal solid waste and up to 800 tons per day of construction and demolition waste. The material is supposed to be trucked in, stacked up to 21 feet high, sorted, and then shipped back out: about 200 truckloads a day bringing waste into the facility, and another 200 truckloads a day taking waste out. The road into the school/proposed facility area is a long, narrow, two lane road, with no sidewalks. The facility is scheduled to run from 5 am to 11 pm, six days a week. The stacked waste will generate 46,000 gallons of toxic liquid waste per year—46.8 percent of the municipal solid waste will be converted to “refuse-derived fuel,” to be burned like coal—and this toxic liquid waste will be discharged into the city sewer. This project has been vehemently opposed by community residents. They have sought help from the Hoosier Environmental Council (HEC), headquartered in Indianapolis, which has provided a Gary-based lawyer to help them. 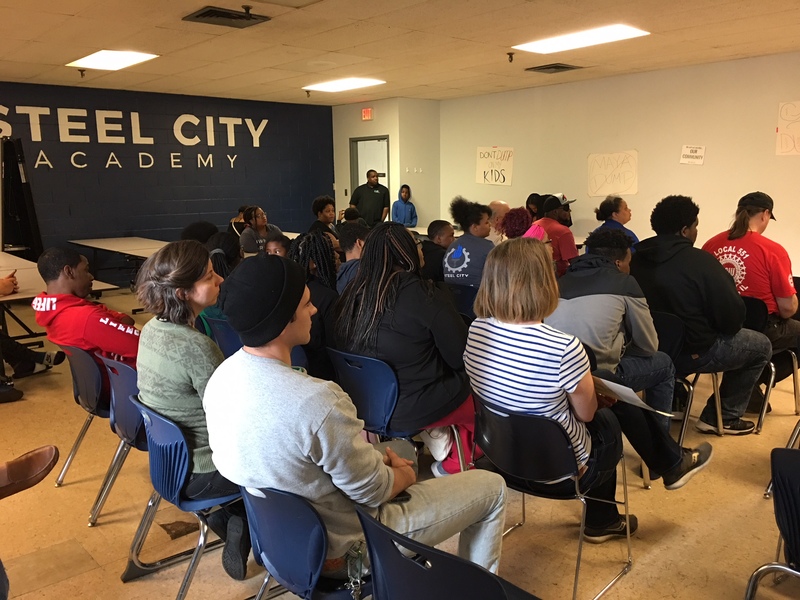 There were over 100 people who attended a community meeting sponsored by the Steel City Academy and the HEC on Thursday, March 1st, overwhelmingly opposing the project. By March 12th, over 1,000 people submit comments opposing the project or requesting a public hearing. It was clear that the community was concerned, and turned out to express their opinions. When this reporter arrived at the Hall, about 50 people were already outside the Hall. The Steelworkers were not allowing anyone to enter. More people gathered outside, waiting to get inside, and when they were not allowed in, they began chanting, seeking entry. Before long, they were told that Maya Energy was not there, that IDEM wasn’t there, and therefore, there was no meeting, and that they had to leave the premises. A police officer came, got belligerent, and immediately threatened to arrest the crowd. Cooler heads calmed him down, and another officer spoke respectfully with several members of the crowd. The long and short of things, was that the meeting was transferred to Steel City Academy, probably 4-5 miles away. However, when this reporter returned to his car to go to the new site, he noticed an IDEM car parked next to his: they had been at the Hall! When he queried the IDEM officials about why they wouldn’t hold the meeting, they said that the “unruly” crowd was not safe. 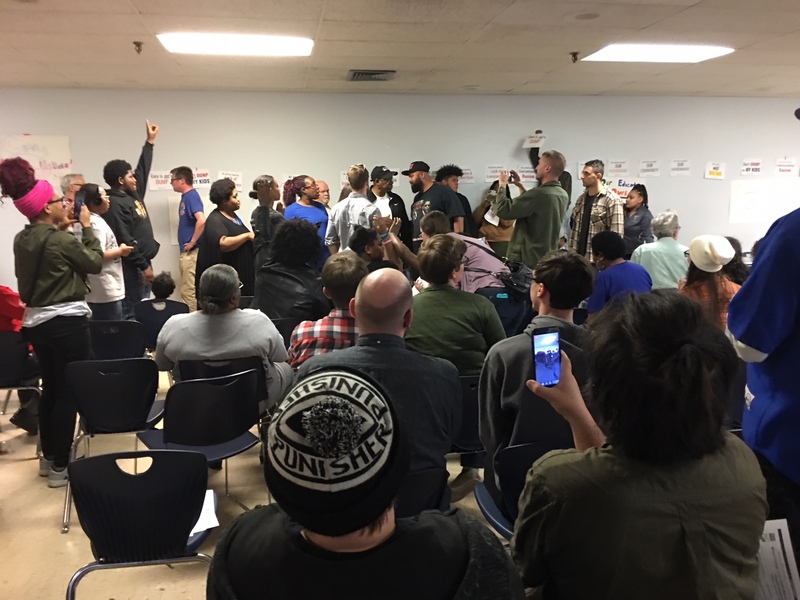 Their nonsense—the crowd had been quite friendly and respectful until staff at the Hall would not permit entry for a meeting they had been told was to be public—was challenged. They said, however, that they’d go to the Steel City Academy meeting (which they did). At the Steel City Academy, the students, staff and supporters all filed peacefully into the building. A woman from the community was the first to speak, and she said she was willing to do everything she could to stop the project, including chaining any fence shut. 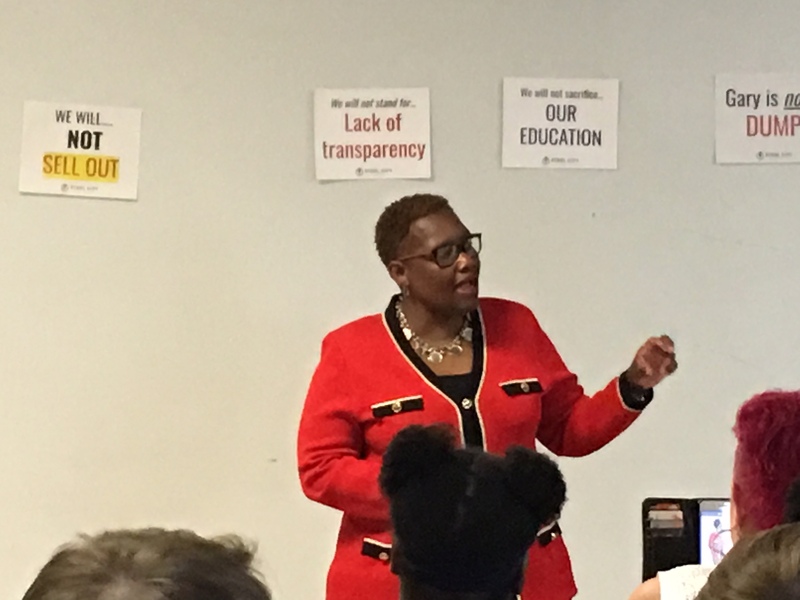 Gary Mayor Karen Freeman Wilson spoke against the dump plan. Substance photo by Kim Scipes.After a couple of other people spoke, Gary’s Mayor, Karen Freeman-Wilson spoke, saying she was opposed to the project. She was appreciated for coming out against the project, although her statement was not very strong. The three-person IDEM delegation then began speaking to the crowd, trying to explain their duties and how the permitting process worked. The crowd wasn’t buying the explanation. They’ve seen Maya Energy get additional time to amend their permit again and again—four times to date. They’ve seen how they’ve been disregarded, and not really listened to. A woman spoke up about her experiences in East Chicago, talking about how she’s got arsenic and other chemicals in her blood, and complaining that IDEM had not helped the community there, and people were seeing it in Gary. Others asked a myriad of questions on all kinds of issues, especially about chemicals used, air pollution, etc. It was clear they were adamantly opposed to the project, and they weren’t too happy with IDEM’s role in the procedure. People were told their comments were “valid,” but that they had to be submitted in writing. Interloper surrounded. Substance photo by Kim Scipes.Finally, a man forced himself on to the floor, said he was the head of the Gary Planning Commission, and stated that the school—not the project—had been denied its permit. He presented no evidence and was shouting at the crowd, who eventually started chanting and telling him “good-bye.” While this reporter didn’t get a chance to find out more about him and who he was representing, someone in the crowd said he worked for Maya Energy. It was clear that he was upset and didn’t want the meeting to continue. After that, the meeting wound down although, momentarily, there was some trepidation about some people “waiting outside.” Fortunately, that turned out to be untrue. As people walked out of the building, students smiled and thanked us for attending and supporting them. Is it necessary for me to point out that most of the school and the surrounding communities are comprised of African Americans, mostly working class folks? It is unlikely people would not be treated this way if the project tried to be sited in Munster, a white, generally upper-middle class community just down the road. But then again, the company did not even try to locate in Munster…. The history of environmental racism is a long and sordid one in Northwest Indiana. Something like 80 percent of the toxic waste dumps in Lake County, Indiana—that closest to Illinois—are located north of Interstate 80-94, in Gary, East Chicago and Hammond. And though Steel City Academy is located just south of the Interstate, it is the latest example of environmental racism in the Region. Dr. Kim Scipes is a Professor of Sociology at Purdue University Northwest in Westville, IN, and has taught a course on “Environment and Social Justice” there for over 10 years. In 2002-03, as Executive Director of The Calumet Project, he played a central role in the fight to keep the Confined Disposal Facility—a toxic waste dump that was to be located within 800 yards of a high school, middle school and inpatient psychiatric facility—from being established in East Chicago, IN, a fight ultimately lost when The Calumet Project lost its funding. It's hard to believe that a dump or recycling center could be placed across from a school. I hope this is turned down because there are often promises made during the planning stages but these promises are not kept when the project is finished. Unbelievable!